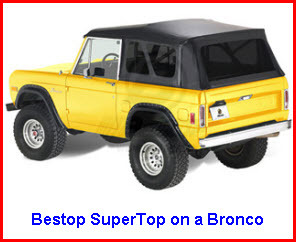 The Bestop Supertop is the result of over 50 years of making tops for Jeeps. The Bestop Supertop is not your normal run of the mill truck cap. It's the result of over 50 years of experience that Bestop Inc. has in the Jeep soft top and hard top business. As a factory supplier for Jeep soft tops, and soft tops and accessories for Toyota, Suzuki, Isuzu and GM the people at Bestop came to the realization that the market needed a truck topper that was really easy to open, close, install and remove. I mean, one person had to be able to do it. So they went out and invented the Bestop Supertop truck cap. 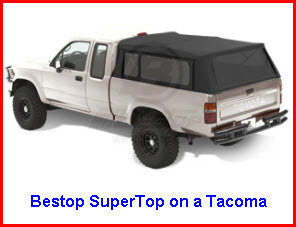 It's not a Jeep truck camper shell, it's not a soft top camper shell, rather it's a Jeep Truck Cap called the SuperTop adapted for use on Chevy Silverado, Ford F-150/250/30, Ford Ranger, Nissan Titan, Dodge RAM and Toyota Tacoma pickups. This thing opens and closes easier than a can of soup because it uses the Bestop folding bow system that allows easy top adjustments and stability in most weather conditions. It's made of top quality fabric (the same rugged fabrics and tubing from which the original Jeep product got its reputation) that is stain, mildew and UV resistant. It takes about 2 hours to install because you have to deal with a bunch of brackets, straps and bows, but once it's installed it opens and closes in a snap of the finger. Anyway, here's some more info on the Bestop Supertop.